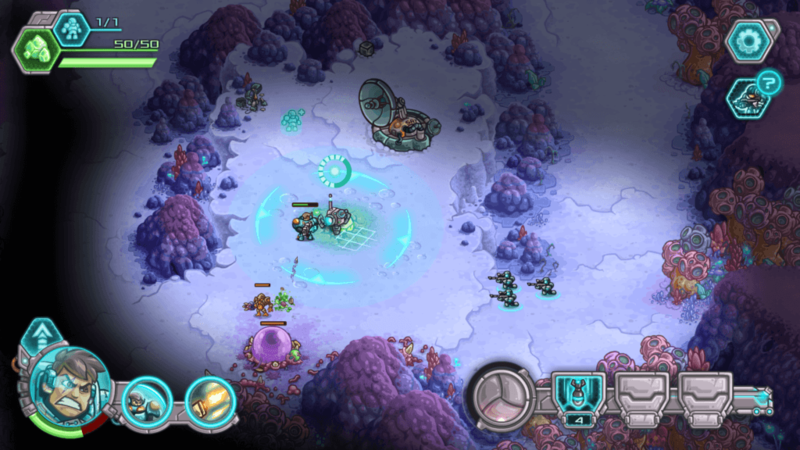 Iron Marines is a real-time strategy game developed by Ironhide Studios. With engaging gameplay, plenty of tactical opportunities, striking hand-drawn artwork and lots of heroes and units, the game will definitely appeal to beginners and seasoned RTS gamers alike. 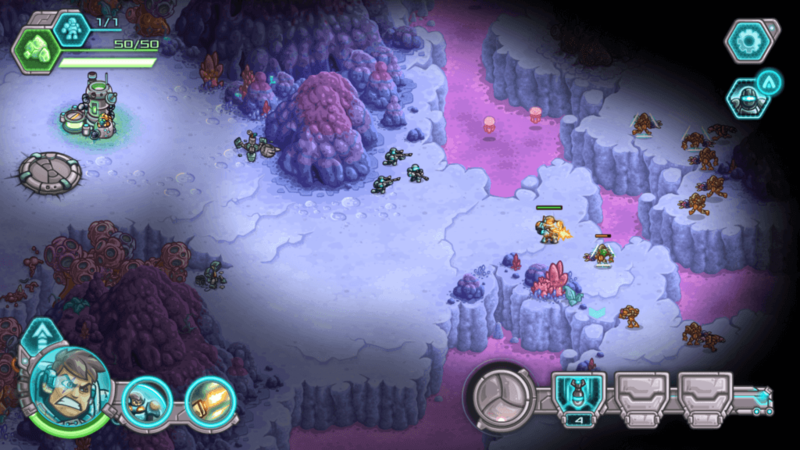 Iron Marines will remind you of old school RTS games. Strategy game fans will love everything about Iron Marines, including its immersive StarCraft-esque missions. 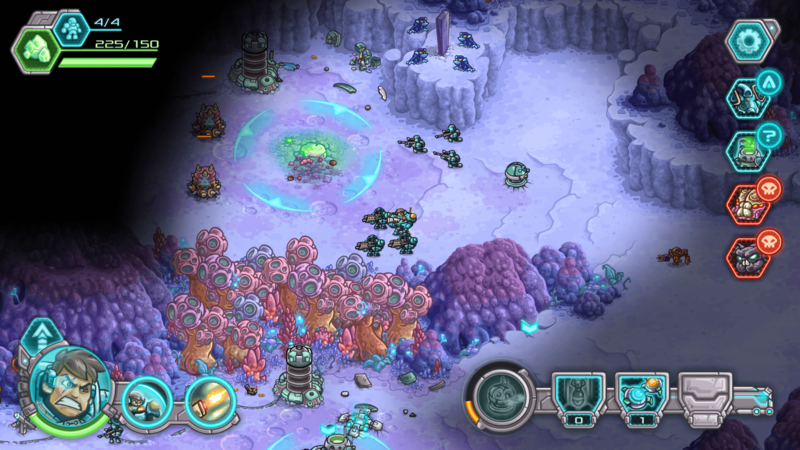 Aliens have invaded your colony and only these special troops can get rid of them. You will be able to command a hero and several other units, such as mechas, snipers, grunts and lots of air and ground units. Along with completing missions, you will also have to protect your base from enemies. Thankfully, the game provides several ways to deal with enemies, including switching troop roles and using special power-ups. These quick tips and strategies will help you know how to use snipers, when to switch squad role, when to change difficulty mode and how to earn credits without spending money. Noticed the squad cap icon at the upper-left corner of the screen? Well, it shows how many units you can deploy. When a mission starts, you can deploy one unit, be it a team of snipers or grunts or a mecha, provided you have adequate resources (“etherwatts”). Just keep exploring the planet until you stumble upon a tiny holographic image of a marine. 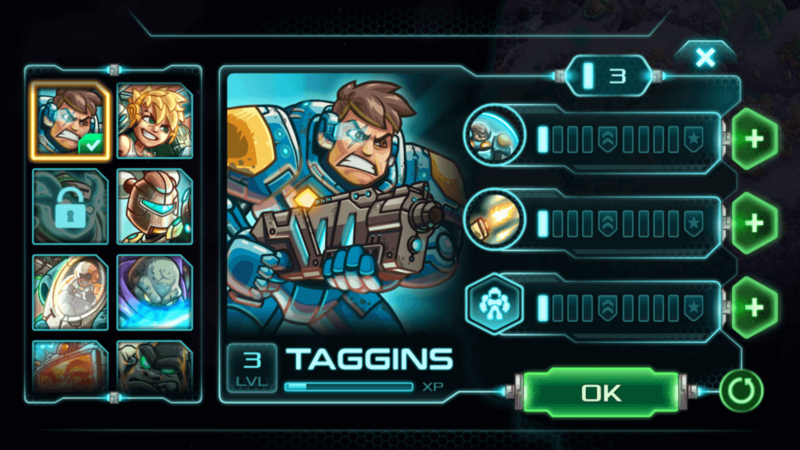 Move your commander or any unit close to the marine icon and wait for a few seconds. You will get an extra command point for launching a unit. Make sure you deploy snipers to support your hero and troops. Snipers have long range rifles and can easily take out incoming enemies from a distance. They will begin shooting when aliens come within their range. You can position snipers somewhere safe so that enemies don’t attack them first. While they are pretty tough, a large group of enemies can easily eliminate them. Place snipers behind your units to take care of incoming enemies, but make sure your hero and troops don’t block their view. Weaker units will be instantly killed by snipers making it easier for your hero, mecha and other units to take out the rest. Bear in mind that obstacles will block their field of view and they won’t be able to shoot at enemies, so keep them in areas where mountains or other objects don’t block direct attacks. In many occasions, you wished you had deployed snipers instead of grunts to take out lots of incoming enemies from a far distance. Thankfully, there’s a way to switch to a different unit type. Simply tap your grunts and select snipers. Your soldiers will change roles immediately. The best part is that you won’t have to deploy another squad, which would have wasted your precious command point, which could have been used to deploy some other unit. Changing roles according to enemy type can be a great way to minimize casualties and get rid of them ASAP! You can try this strategy on your mechas. If you have mistakenly deployed anti-air mechas when there are more ground units attacking your base/squads, just tap it and switch to “Flamewalker”. Whenever a new enemy appears, its portrait instantly shows up on the right side of the screen. Tap the icon to get key information about the new enemy, which may include its strengths or weaknesses, attack style etc. Make sure to switch to a different role based on the enemy’s attack style. If the enemy attacks from a distance, then you can deploy grunts or the flamethrower to kill him. If they are aerial enemy units, then you can deploy anti-air units or build anti-air towers to destroy them. Assigning points improves skills and your hero will be able to attack and defend against tougher enemies without taking much damage. Make sure you reach a skill milestone (denoted by a silver and golden medal) to unlock extra abilities. Example: Reaching Taggins’ “Personal Shield” milestone (silver medal) will unlock a unique ability called “Energy Backlash”. This will enable your hero’s shield to reflect some of the melee damage received, thereby inflicting extra damage to enemies. You don’t want to end up losing every mission, so choose your difficulty mode wisely. If you are new to real-time strategy games, then you should select “Casual” which offers a fair challenge to beginners. For expert strategy gamers, “Veteran” difficulty mode should be a good choice, but I would recommend playing the game in “Normal” mode as missions under normal mode are also pretty challenging. If you find it too easy, then you can go to “Settings” (gear icon) and change the difficulty mode anytime. You can also play the game in “Impossible” mode, but you will need to unlock it first by completing the entire campaign in any difficulty mode. 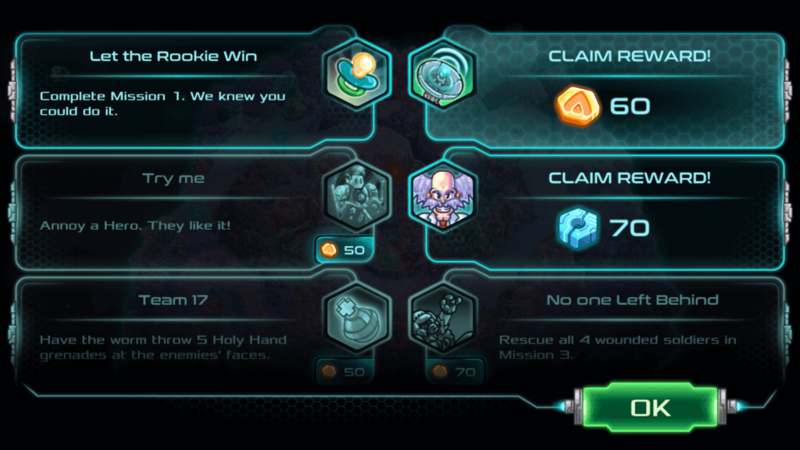 The credits you receive from missions can be used to purchase special power-ups. You can use these power-ups against enemies when you are on a mission. You can equip a maximum of three power-ups. Just tap the missile icon on your home screen and select a power-up you think would help you win missions comfortably. Invest credits on Replicant Mines and Etherium Surge as they can be very useful in your mission, plus they cost only 60-75 credits. The Etherium Surge adds extra 50 etherwatts instantly (etherwatts are your main resources that will let you deploy troops. You will need a certain amount of etherwatts to deploy units and the amount changes from one unit to another) to your reserve. As the name suggests, Replicant Mines replicate themselves every few seconds. A single mine can produce up to 4 more mines of the same type, so make sure you place such mines at strategic points. Finish Achievements: Tap the medal icon on your home screen to get a list of achievements. Complete an achievement to get 50 or more credits. Win or lose a mission, you will receive credits. However, you will get fewer credits if you lose a mission. Try replaying a mission to see if you earn some extra credits. You can also get credits by watching a 30-sec video. Tap the play icon located on the upper-right corner of the screen and then tap the box under “Popcorn Time”. You can earn up to 60 credits per video. You can research tech using tech points. These bluish nut-shaped objects can be used to unlock advance tech that can aid you in your battle against aliens. Earn tech points from missions. Once you have earned enough points, you can tap the wrench icon and unlock new technology, such enhancing gunners attack rate, increasing squad armor, improving normal attacks of all army units and many more. You can also upgrade a technology that you have unlocked recently. The empty bars shown beside a technology icon suggest that it can be further upgraded. Just tap a tech and then tap the check icon to confirm upgrade. Points will be deducted from your total techpoints. If you want to start over and allocate points to some other tech, just tap the green reset button. The undo button is located next to the big “OK” button. Soon after you have captured an alien base, the first thing you need to do is install towers to fend off multiple incoming enemies. As of writing this Iron Marines guide, there are two towers, one that shoots missiles in the air and the other that can take care of ground units. You can select the one you feel will be the best defense against aliens. Some bases allow you to set up more than one tower, so you can definitely install two different towers to defend your base. You can also enhance your tower. Just tap a tower to bring out two new options and select the one you think can improve your tower. For example: Tapping the Mini Gun tower will bring out three options – You can either select “Overhaul” that activates a mechanic drone to repair your partially damaged tower or “Vulcan Barrage” that fires a storm of bullets towards incoming enemies dealing extra damage to them. The third option is to dismantle the tower. After dismantling, you will receive a few credits to your account.